Back for 2019, Swim Serpentine is the newest member of the London Marathon Events family alongside the legendary London Marathon itself and Prudential Ride London. Held in the Serpentine in Hyde Park, the venue for London 2012’s open water swimming competition, this fourth year event has returned with some exciting new additions. If you have your own place and want to take the plunge for people living with cancer then join Team Macmillan today. Our charity places are a great way to make a difference to people affected by cancer. Simply click the ‘Get a place’ button and complete the registration form. There is no registration fee, we just ask you to pledge to raise a minimum sponsorship amount of £150 - ½ mile, £200 - 1 mile, £300 - 2 mile. Online entry is open. 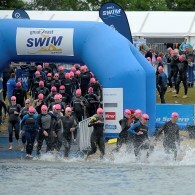 Sign up by visiting swimserpentine.co.uk and tick the box to support Macmillan. Or, once you have your place, you can join the team by clicking the ‘I have my own place’ button. If you sign up for your own place we will be with you every stroke of the way. We will send you a digital welcome pack with everything you need to kick-start your fundraising and training, including a sponsorship form, training guide and some great fundraising ideas. 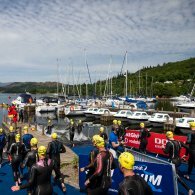 Within the pack you will also find a merchandise order form which you can complete and return to receive a free Macmillan t-shirt, swimming cap and wetsuit arm band to show you’re swimming for Macmillan. So, sign up today and help us support people living with cancer. Whether you have your own place in the Swim Serpentine, or secure one of our Macmillan guaranteed places, we will be with you every step of the way. We will send you a digital welcome pack with everything you need to kick-start your fundraising and training, including a sponsorship form, training guide and some great fundraising ideas. Within the pack you will also find a merchandise order form which you can complete and return to receive a free Macmillan t-shirt. We will be there to support you on the day; to provide free refreshments, wish you the best of luck and most importantly to say a huge thank you for choosing to swim for Macmillan. So, sign up today and help us continue to support those people affected by cancer. I have my own placeIf you've already got your own place and want to fundraise for Macmillan. Get a placeJoin the team today! There's no registration fee, simply pledge to raise the minimum pledge.